Not about food. This is about ankle hair? Where did all my ankle hair go? As you grow, um, older, you find that there is hair where you never had hair and hair missing in places where it used to be abundant. The top of the head seems to fall short of its required allotment and there is a crop growing, unfortunately from your nostrils, ear lobes, and that one rampant six incher that sprouted up overnight from your eyebrow. But for me, I seemed to lose a crop that I had never really noticed, until now. For the past, I don’t know how long, I’ve worn socks. You dress for work, living in Canada most of the time it’s for warmth, or you just have the routine drilled into you from your parents that you need to wear socks. Civilized people wear socks! Then one day in your fifties you look down and realize that you have these bizarrely naked ankles. Your leg hair stops at the spot where your socks begin. What happened to my ankle hair? Was it the rubbing of the tight fitting socks? Was it the absence of oxygen getting to the area, or was I born with a natural barren area of hair follicles? I have a little hair on my toes (not in the sasquatch sense) but nothing for a six-inch area above my ankle. I’ve been out of the corporate world for some time now and my suits are collecting dust in the closet as well as my excessive assortment of business wear. My sock collection has reduced into a few and far between assortment of mismatched and one offs. Since socks are not a mainstay of my daily existence anymore a curious thing has happened to my ankles. I’m growing hair back there! This has turned out to be an exciting experience for me. Daily now I check the progress of the filament development. Is there more than yesterday? Is there less? Is the once barren patch now a developing thatch? Will it grow in thicker and resemble hamsters mounting my legs in a questionable embrace? What will become of this? Why am I so focused on my ankle hair? Being of Scottish heritage, for me tanning is not an option. It’s not that I don’t want to or like to, it just doesn’t happen. My leg hair is the only thing that gives the illusion that I have any melanin in my body. The absence of ankle hair makes it appear that I have never exposed my feet to sunlight let alone been wearing wellingtons all my life. I’m not vain, it just looks funny. So I welcome the new crop and hope it fills in faster than it took to disappear. Growing new ankle hair in your fifties is, well, exciting. The ear hair I can do without. Be well and eat (and grow ankle hair) well. Alone and with a can of #Spam? There are no rules! If it can fit on the grill, it’s going on the grill! So I found myself alone and wanting to experiment a bit. I’ve often espoused the virtues of #Spam as a food element. Spam is a pre-war luncheon meat creation from 1937. In 1970 the two billionth can of Spam was produced and at the same time reached new popularity because of Monty Pythons Spam routine. In 2007, Spam distribution worldwide hit 7 billion. Spam is a combination of Pork Shoulder and Ham and has been used in a variety of ways throughout the world. Enough of the history lesson lets just say it’s tasty and fun. 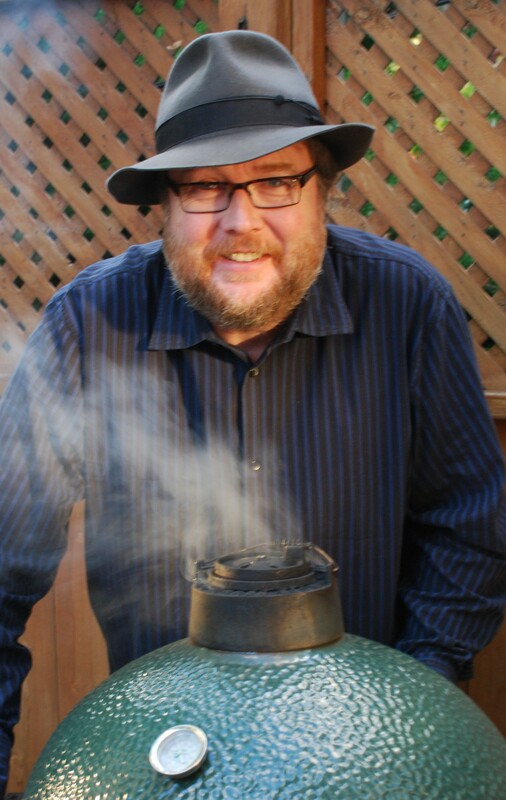 So alone with a can of Spam, a Big Green Egg, and my slightly disturbed creative mind what could I possibly come up with? 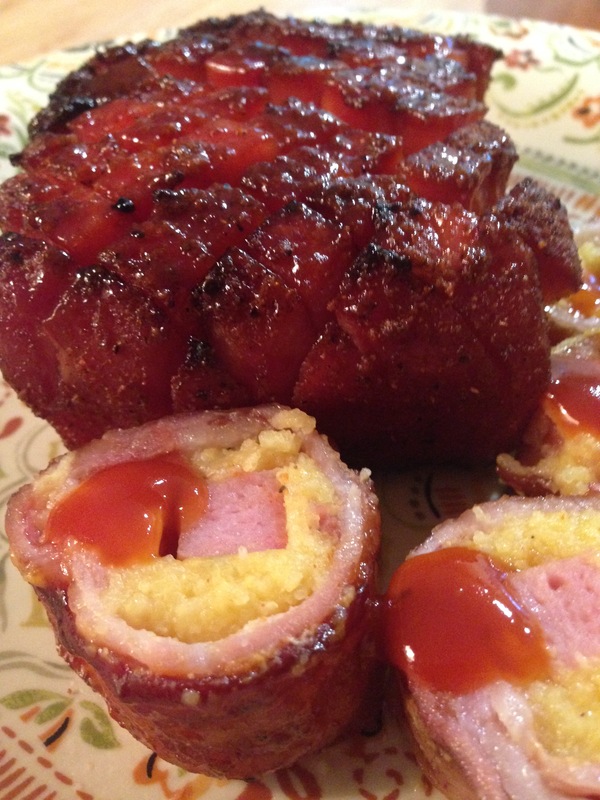 How about a Spam, Bacon, and Polenta Maki roll? I’m in! Also a Smoked Blooming Spamion (I invented that word). So here we go. The Maki roll was wrapped in bacon instead of Nori and rolled with a cheddar polenta. The rest of the lovely porky can was sliced 3/4 of the way through to create a checkerboard pattern and spiced with a maple sugar rub. Since everything except the bacon was cooked, they both sat on the BGE for about an hour on top of granite grilling stone. The Maki was turned every 20 minutes to cook and create crispness on the bacon. Will I do it again? Yes but next time I think I will forgo the polenta and try sushi rice. The reason I didn’t try it first? I didn’t have any. Don’t get all snobby about Spam. Experiment! Try it! It’s not scary and far from ordinary. Everyone defines himself or herself by an action. You play sports, your career, or community service. Maybe being a parent. But you define yourself. I’ve worn many hats, (I like hats) and I still do, but I define myself with food. Specifically BBQ. I’ve been busy over these past few weeks, on and off my grill and smoker. I hold a part-time job, write, and cook. I thought I’d share a few of my creations that have come to life over the months and days that have been. Curry is one of my secret passions. My father introduced it to me when I was young. His favourite came out of a yellow can in the form of a chicken curry. It was hot, spicy, and burned my mouth. At a young age I couldn’t figure out how anyone could eat it. At this time in my life I have to tame back the spice and heat if I expect anyone else to eat it. 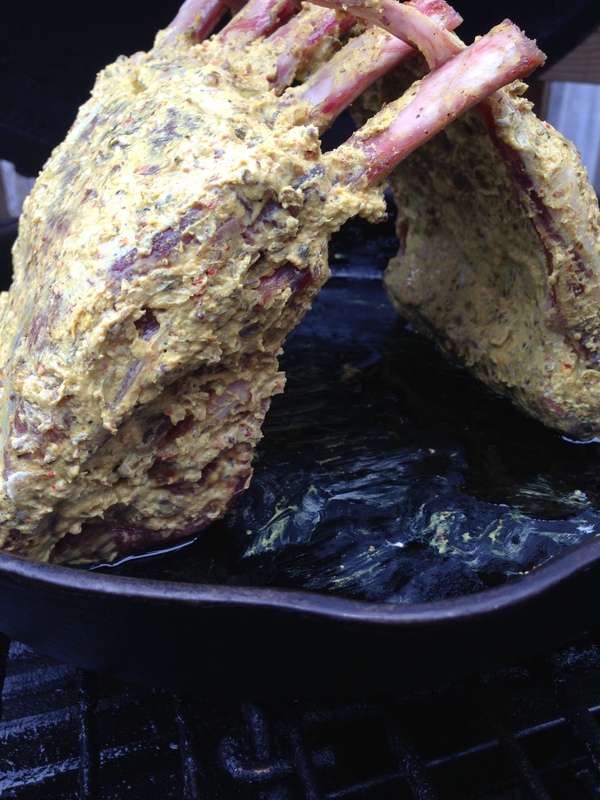 The rub is a standard medley of spices, mixed with yogurt and let brake down the meat. So good and so warming. I can’t understand people that shy away from it. Served with toasted coconut rice to add some sweetness. Ok, a little weird but these days’ people put anything on their hot dogs. Why not grilled shrimp? I spiraled the dogs before grilling so they opened up and created nooks and crannies for your condiments to hide and hold onto. You also open up new surfaces to create a crust to pop in your mouth when you bite down. Additional toppings added were bacon (of course) and a Jalapeno/Avocado dressing to add a little heat. Don’t mock, try. Ok really Bacon and Sausage Maki. Everything was slow smoked on the BGE. 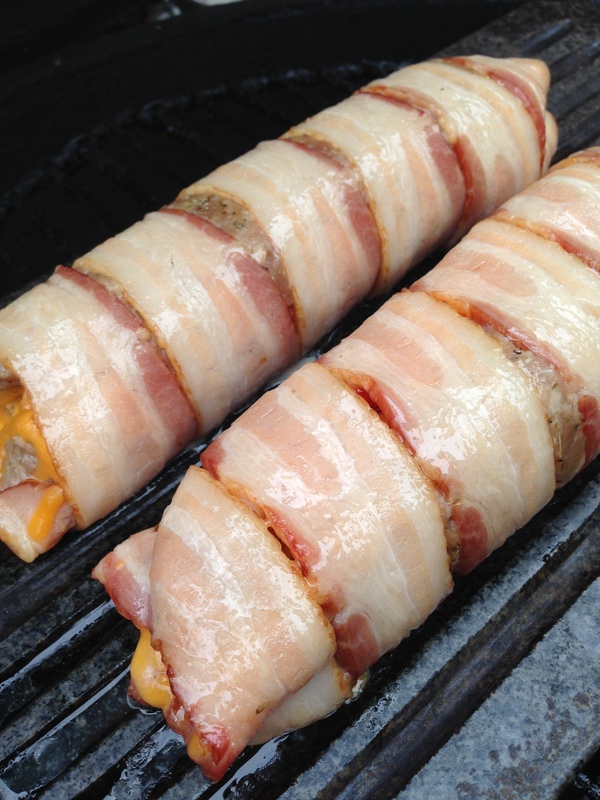 Stuffed with Italian sausage meat, diced onion, sundried tomatoes, and provolone. Think of it as a junior version of a Fatty. Sliced up and presented as individual slices. It looks like sushi but tastes like BBQ. Andouille Burgers with grilled onions. Hungry yet? So the year is over and the new one has started. Hopefully it was a wonderful one for you. You embraced family and friends and possibly made resolutions. I’ve learned in life that resolutions are easily broken and we forget the changes we wanted to make or the challenges we set before ourselves to conquer in the days before us. But I have set a simple goal for myself and maybe, just, maybe you will want to follow suit. My life has changed drastically over the past 365 days. New digs, new philosophies, and a better understanding of myself. For years I have read or listened to self-improvement pieces and while not adopting everything, I have found certain words and statements that have stuck in my mind. Norman Vincent Peale wrote the doctrine on positive thinking and one story that he shared was about the man who was “just being realistic.” He listed off all the things that had happened in his life that he thought were realistic. At the end Dr. Peale repeated everything that he had said and showed him that everything he had said was negative. Being realistic means looking at both the positive and the negative. He had only listed off the bad things that had happened to him. I do this, we all do this. We classify negative experiences and events with the word realistic. There is so much good n this world but we choose to look only to the bad. What about the person that held the door for you today while your arms were full, the amazing dinner that was create with love by your partner, the song that came on the radio just when you were thinking about it. Maybe just the feeling that you are loved! These are all good but we overshadow them with the bad or negative and they disappear from our thoughts in an instant. So here is my resolution. 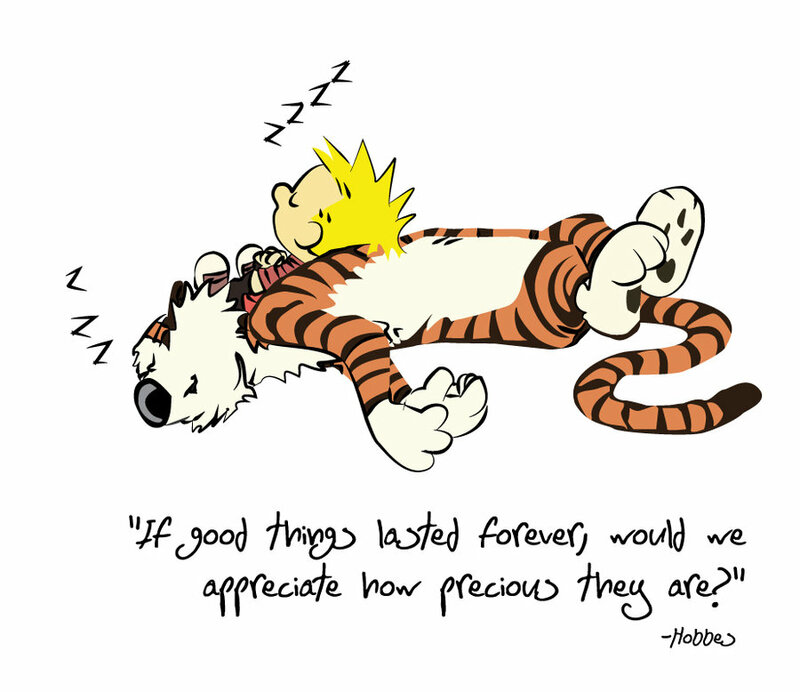 Find the good in life. Look for that person or thing that brings a smile to my face and shield the bad away. Be happy to watch the birds at my feeder, hug instead of shake hands, and find new ways to influence others around me to find the good. So there is my resolution. Simple and easy to follow. Happy New Year world! It’s going to be an adventure! Turkey on the Smoker? It must be Christmas! So since Christmas is just a week away, I thought it appropriate to share instructions for brining and smoking your bird outside. Brining brings out the best in your bird and keeps the meat from drying out. Using a cooler, bucket, or whatever you have to hold the bird and totally cover it with your brine is what you need. If you can’t source anything, go to your favourite restaurant and see if they will sell you (give you is better, they just throw them out when they have too many piled up) a bucket that their fry oil comes in. Thoroughly clean and wash the bucket and make sure your bird fits. Best way, try it when it’s empty. That way you can fill it with water and see how much brine you’ll need to make. Bring the water to a simmer to dissolve the sugar and salt but don’t bring it to a boil. When all the ingredients are combine, turn it off and let it cool. Place your bird in the container and pour the cold brine over top. Add ice to keep it cool. The bird will need at least 6 hours in the brine so this is your Christmas Eve project. After 6 hours, take Mr. Turkey out of the brine and wash your bird well under cold water. Place in the fridge overnight. Throw out the brine! Make a flavoured butter. This is another creativity opportunity and should be done the day before. Smooth all the flavors together. Place in the fridge till you need it but bring to room temperature just before you need it. It has to be soft. Know how big your bird is and how long the smoking (cooking) process is going to take! Know when dinner is being served! Prep and know how long your accompaniments are going to take! Get as much done ahead of time as possible! Make sure you have enough fuel for the smoker or gas BBQ! Have your wood chips soaked, pouched and ready to go! Build a schedule and work it! Separate the skin from the meat by working your fingers gently between the breast and the skin starting at the cavity opening of the bird but being careful not to break the skin. Gently work the soft butter into the space you just created. This flavored butter will melt into the breast basting it in butter and all those flavors you added to it. Take the extra butter and rub it all over the outside of the bird. If you ran out of butter, massage it with olive oil. Season your bird with salt and pepper. Now stuff your bird with additional sage, quartered onions, garlic cloves and some lemon or orange slices. Your stuffing should be done separately. At this point your bird is brined, washed, dried, seasoned, and stuffed with aromatic. You’re ready to go. Pick a suitable wood for the smoke, like oak, pecan, or maple. If you use cherry or apple it is tasty but can create a pink ring under the surface and if you family doesn’t know smoke, they might think it’s undercooked. Soak your chips and make a smoke pack with one part soaked chips and one part dry. The dry will start early and the wet will smolder after the dry is done. Make two or three packs so you’re ready when one is done with a new one. Place a pan on the unlit area to catch the drippings. Tin foil roast or baking pans are great for this. This gives you a drip pan. Add water, wine, and whatever else you would place around the bird in the oven. This gives you the base for your gravy. 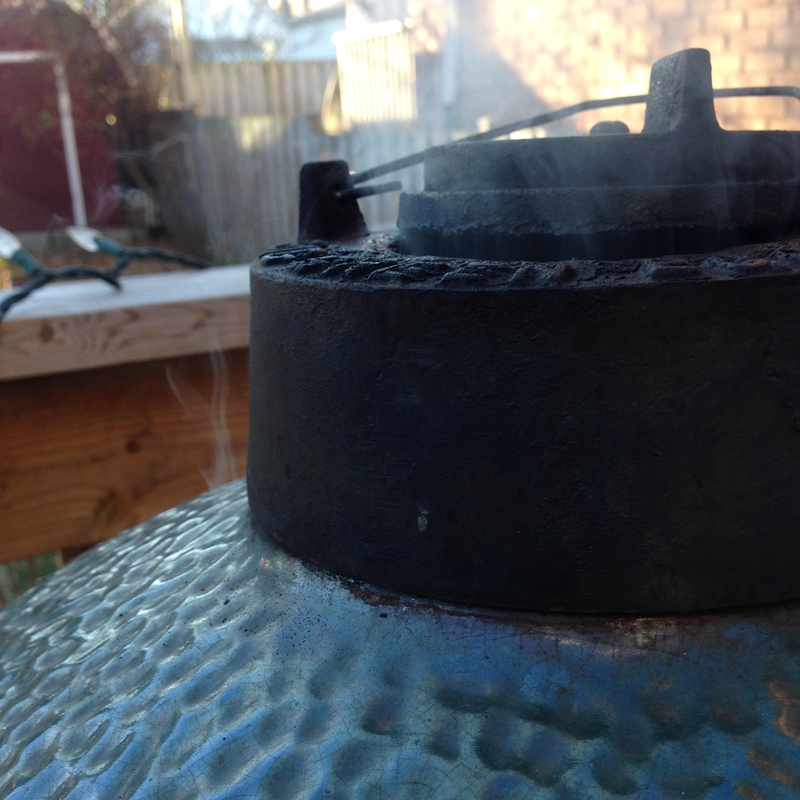 Place your smoke pack on the heated element or on the coals. Bring your grill to 400 degrees f. Smoke and roast for about 1 hour then turn the temperature down to 325 f. An 8 to 12lb unstuffed bird should take between 3 to 4 hours cooking time, subsequently an 18 to 20lb bird should take about 5 to 6/12 hours. Time can vary by 30 minutes so have a thermometer ready to check internal temperature (you want 165 degrees f) and always from the thickest part of the thigh. . Place the bird breast side down on your greased grill and over the drip pan. Rotate your bird every 45 minutes or so to brown and cook evenly. 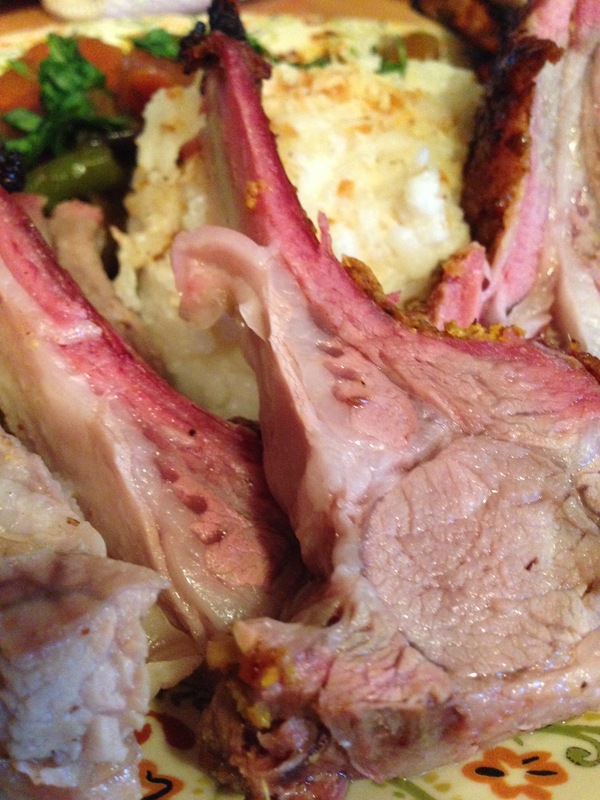 Every grill and smoker will behave differently so pay attention and remember if you’re looking, you’re not cooking. Take some of the juices that have accumulated in the drip pan and baste. To minimize open lid time, you can create a secondary baste liquid of heated chicken stock with sautéed bacon, sage, and onions. Have it ready to go. 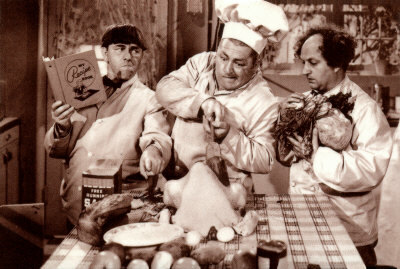 So open the lid, turn the bird, baste the bird, and close the lid. Pay attention and follow your bird’s path. Outdoor climate will affect the overall time but with patience you can create a Christmas turkey that will astound your family. The classic French rules say that your cooked bird should stand as long as you cooked it for. I can’t do that but I will let my bird stand for at least 30 to 45 minutes after it’s out of the heat. Cover with tin foil and let the juices work their way back through the meat. If you do this and don’t turn off your grill you’ll have plenty of time to cook your veggies, stuffing, and make your gravy on the BBQ. Remember planning is everything! Post a picture to my Facebook site of your wonderful accomplishment. But most importantly, have fun with it! I’ve been smoking our Turkeys for 10 years and I’ll never go back to the oven. It makes the difference. Be well and eat well this Christmas and every day! So I do the chef thing for a large grocery chain in Canada two or three times a month. They have professional kitchens and I get to stand in front of a crowd, (usually the same crowd), and teach them how to make different and unique recipes to break the mundane traditions that some fall back on for dinner. It gives me and them a chance try different techniques and foods from around the world. And I get paid for it too boot! The recipes are supplied a week or so in advance so I can try them out before presentation day. It’s an hour to prep and an hour in front of the crowd. I create a complimentary recipe on the side of the head office one so if it’s pasta I create a salad, soup I devise a bruschetta, if it’s meat I come in hand with a potato or veg. You get the picture. 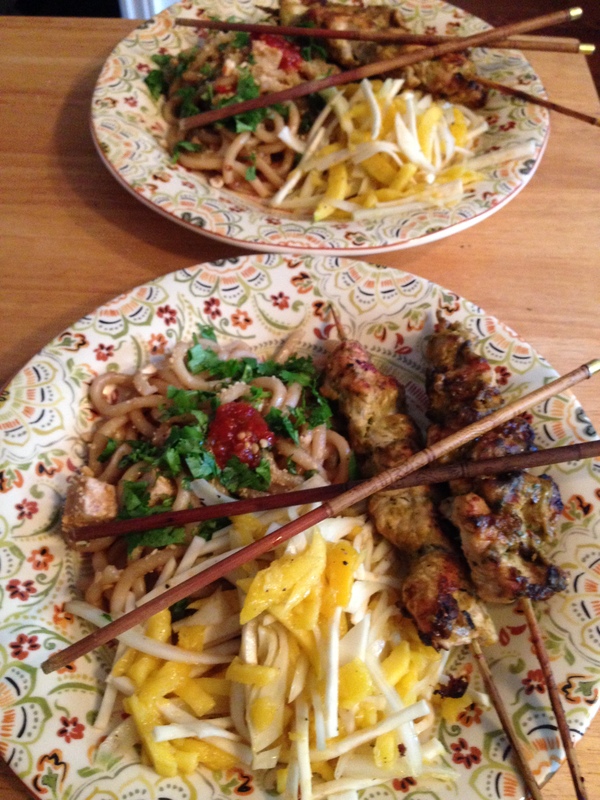 So last week I was supplied with a recipe for a peanut turkey satay. My accompaniment was a mango and celery root slaw. It seemed keeping with the theme of the main. Or so I thought. Practiced, prepped and ready to go, two hours before the event I received an email to tell me they had sent me the wrong recipe. The peanut turkey satay had suddenly turned into Lentil Soup? But they thought my slaw would go well with it? Really? So here I was with my chef jacket in hand going out to present something I had never made before in front of a group of paying customers. Needless to say, watch for me on the next episode of Dancing with the Stars. I learned very quickly how to do the Quick Step! It’s funny that life throws left-handers at you when you’re expecting a right-hander at the mound. But you can’t sit out the inning, you half to take your turn at bat, so grilled turkey turned into soup. Soak 20 8-inch (20 cm) bamboo skewers in water for 30 minutes; drain. Cut turkey breast into 20 long thin strips. Thread one turkey strip onto each skewer, leaving 1-inch (2.5 cm) skewer bare at bottom. In food processor, combine green onion, peanut butter, coriander, lime juice, fish sauce, brown sugar, chili paste, soy sauce and 1/2 cup (125 mL) water. Pulse for 10 to 15 seconds or until sauce is smooth. Divide sauce between two small bowls. Brush one bowl of sauce liberally over turkey skewers; cover with plastic wrap and refrigerate for 30 minutes. Preheat barbecue or indoor grill to medium-high heat. Remove turkey skewers from refrigerator; spray each side with cooking spray. Place on grill. 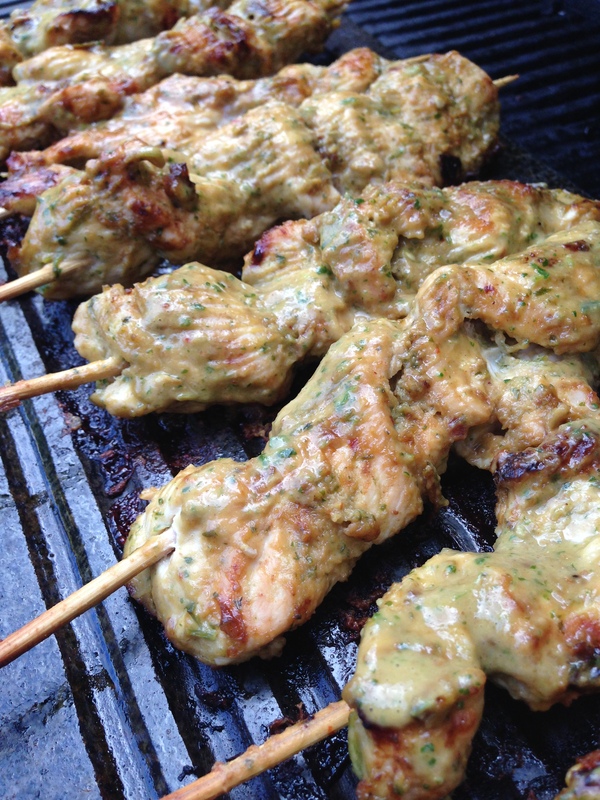 Put a strip of foil under bare part of skewers. Cook for 4 to 6 minutes, turning occasionally, or until cooked through and nicely charred, being careful not to burn. Transfer to platter; let stand 1 minute. Serve with remaining bowl of peanut sauce. Combine everything except the mango in your serving bowl. Toss to coat fennel, celery root, and red pepper with the dressing. Cover, refrigerate and let sit for 20 minutes. Oh and if you’re wondering, the Lentil Soup went well too. If you have to dance, do it as if no one is watching! What do you do when you’re tired of the same old but everyone around you still insist on it. Make it different and wait for the backlash, or make it the same in a new way? After a summer of BBQ, (actually it’s a way of life around here), I get bored of the classic baked potato yet everyone still expects it to make a showing on the table. Fall has hit quickly in Toronto and the chill is on us. The baseball season is at end and the playoffs are in sight. So using a ball euphemism, I decided to develop a baked potato curve ball. 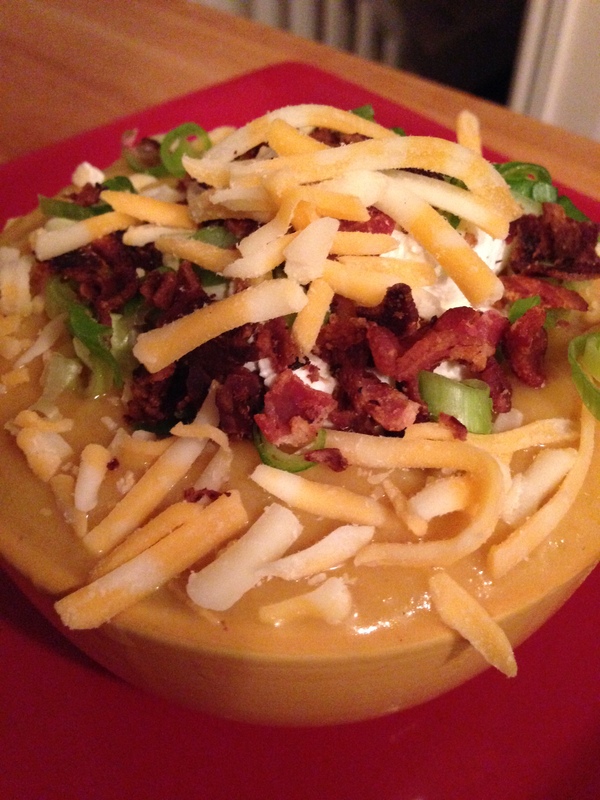 Taking the task partially outside I created a Full Loaded Baked Potato Soup. Yes extreme, yes filling, and yes wonderfully satisfying. Each year we celebrate a Canadian Thanksgiving outside and on a farm in Northern Ontario. My responsibility, the tailgate! With the temperature dropping I think that this will make a good addition to the food so I decided to experiment first. When making soup, I prefer to roast off my vegetables first instead of just sticking them in the stock to cook. To me it brings out more of the natural sugars and taste in the base flavour. So not to break my tradition, I roasted off 6 Russets and the carrots for my stock first. When they were soft and ready, I sautéed half an onion and celery in a large stock pot with olive oil until they were soft and translucent. Rough chopped 4 of the potatoes and the carrots and Added them to the pot with, garlic, salt and pepper and 3 bay leaves. Topped the whole thing off with 2 liters of chicken stock and let it simmer for an hour. 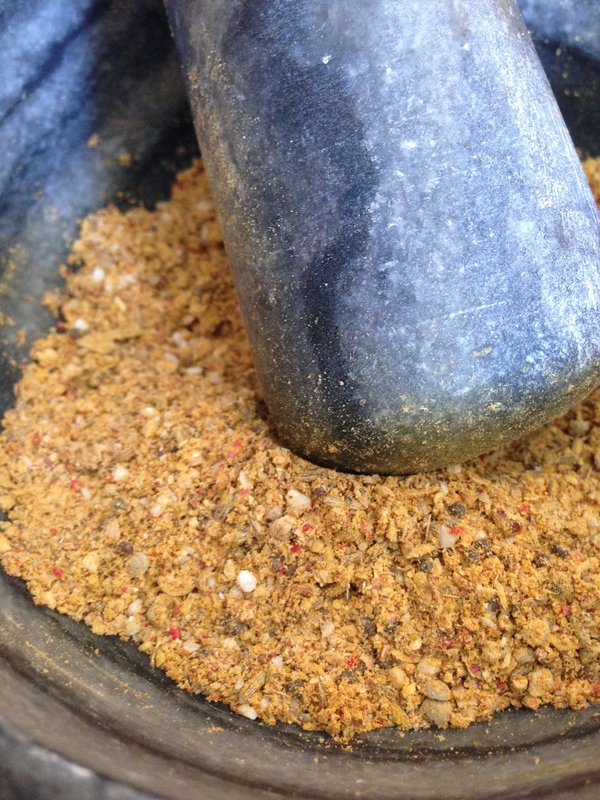 I threw in two tablespoons of a BBQ rub that I had made to bring some of the outdoor spice and aroma to the soup. After the hour the stock was blended down to a smooth consistency ( after taking out the bay leaves), placed back in the stock pot and put on low. The remaining two potatoes were rough chopped into bit size pieces and joined the other happy elements in the soup. Keep extra chicken stock around and if it’s too thick for you, thin it out to your liking with some extra. 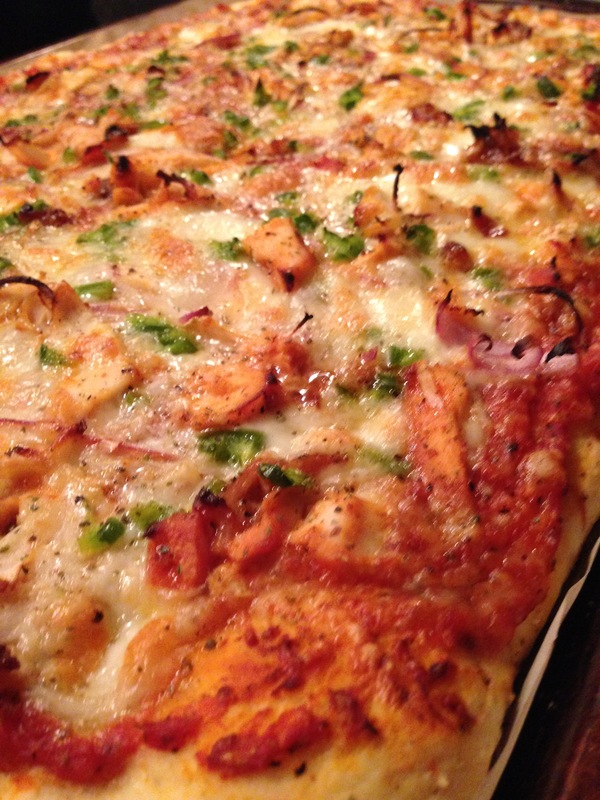 Finished with sour cream, crisp fried bacon, chopped green onion, and shredded cheddar for the fully loaded part. Take a look. It feels like soup to the mouth but tastes like a baked potato. Putting a different spin or preparation on an old favourite is a way to break from the norm but still fill the need of the comfort you and your family get from the staple. I remember a teacher from high school giving me instruction on how to look at a situation. That’s how to keep an old favourite from creeping into mundane territory. What can you do to your standard and give it new life? PS. I think the family will like this at Thanksgiving!